Your feet along with your brain are the two most indispensable parts of your body in Special Operations Forces. I’ve said many times what my mentors who trained me long ago have said over and over. Your feet are your lifeline in Special Operations. Take care of them and they’ll take care of you. Having spent many years in the Special Forces Regiment, care for your feet became second nature and will be a very necessary function. We’ve posted several articles on having proper fitting boots and socks here at SpecialOperations.com in the past and much of what you’ll read here are things that we’ve said in one-way shape or form before. But with the Selection classes geared up and the inevitable flurry of packets submitted in the spring, we have gotten some email questions that we’ll try to answer in this and follow-on posts. By far the majority of the posts we get around Selection, especially SFAS center around either rucking or the Star Land Navigation course. To be successful at each, candidates will be doing a ton of moving and that means moving out with a purpose under a heavy load. Therefore, it is imperative for the successful candidate to have proper fitting boots and socks. So today we’ll go back and touch on those two areas because if either boots or socks become a problem area in Selection, your chances of passing successfully will plummet. It will also be a good time to revisit the care of your feet and along with the proper boot and sock fit. For many of the younger guys getting ready to attempt Selection, this may seem like a trivial matter, but trust me it is not. In your prep for Selection, it is always a bonus to have a training partner that has been in a light infantry or an airborne unit. This knowledge will already be second nature to them, however, if you don’t have that advantage or background seek out the advice on this subject from any veteran before beginning your prep for Selection. I don’t have any knowledge that things have changed at SFAS, although things are always in a state of change there. However, in this case, candidates have in the past not been able to wear any of the high-speed boots in Selection. If you’re attempting SFAS, boots must be compliant IAW AR 670-1. So, that means most of the cool guy boots from Merrell, Salomon, Lowa, Asolo, et al will have to wait until you get to an operational unit. If that changes, we’ll let readers know. The key for proper fitting boots is ensuring that the boot’s heel sits tightly to the rear of the foot while giving the toes some wiggle room up front. If your foot is sliding around too much, either front to back or side to side, you’ll have friction, which leads to blisters. If your boots are too tight, your toes will be curled up inside and that is a blister waiting to happen. Some people advise buying boots a half-size too large because your feet will swell on a long-range ruck march. I wouldn’t recommend that but if your feet swell that much it may be an option. Without a well broken in second pair of boots, you are setting yourself up for failure. You are going to get wet a lot during Selection, even on days when it isn’t raining or snowing. It is the nature of the beast. During the events of that day, your feet will inevitably get wet. But that night, allow the boots to dry out and stuff them with paper towels or newspaper and allow them to dry out properly. Wear the second pair the next day and the first pair will be ready after that. And if your boots blow out on you during an event, you will have a second pair of well broken in ones to take their place. Having to use a new pair of non-broken boots in Selection is not the way to get thru the course with your feet intact. 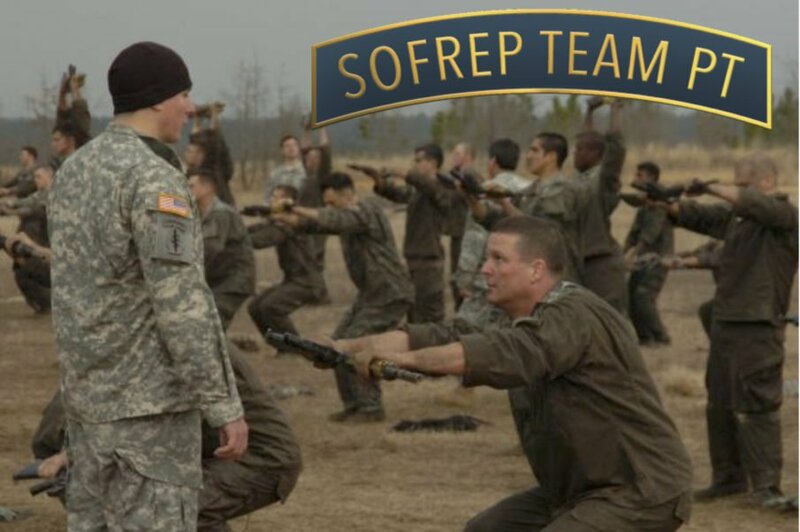 While a cadre member at SFAS back in the day, one February class was very notable. It was cold and damp and it rained/sleeted and even snowed hard on the candidates nearly every day. The soft sand trails of Camp Mackall, North Carolina were soupy and underwater in many places. The candidates’ feet were wet nearly all the time, and because the training never stops, their feet suffered. Nearly all had multiple blister problems and our cadre’s medics were working overtime. Many of candidates had feet that resembled raw hamburger by the end of team week. They were forced into switching out their boots daily and those who didn’t have a proper second broken in pair suffered the worst of all. Most of them were gone before long. You should have a good set of nail clippers with you when attending Selection and ensure that you take good care of those as needed. Here is where you must know your own body and what works for you. Everyone is different and what works for me, may not work for you and vice versa. That’s where the proper preparation and training BEFORE you get to Selection is invaluable. Some guys like to spray their feet or use a roll-on type of antiperspirant which is supposed to stop the sweating which is the cause of blisters. While I was never a big believer in this, if your feet sweat profusely as mine do, then by all means, try it during your prep phase to see if it works for you. Other guys, I’ve seen use Vaseline or some type of oil or cream to reduce friction. Again, it isn’t something I’d recommend but it does work for some people. What worked for me was to use just a small amount of Gold Bond or talcum powder on your feet and in your socks before going on a ruck march. Not too much, it is like anything else, if you put half a tin in your socks, it will clump up and create just as many problems. It cuts down on friction which creates blisters. I’d recommend putting some around your crotch as well. If you get rubbed raw and many will in your nether regions, it isn’t pleasant walking for miles every day that way. Socks are your feet’s last line of defense. Just as proper socks will protect them from blisters, poorly fitted ones will cause even more problems. So first, what causes blisters? Heat, friction, and moisture. We’ve already covered getting a couple of pairs of boots that fit well, don’t rub, and are ventilated so your feet can dry out quickly and allow some air flow inside. Initially, get a good pair of tightly fit synthetic or polypro socks that will wick the moisture away from your feet. Rub your feet down with a light coat of powder or whatever you choose and then turn them inside out. Why? So that the stitching inside won’t rub your toes and create hot spots. That stitching can and will cause blisters. The thick military issued wool socks go over the inner layer of socks and once again inside out to prevent the stitching from rubbing and creating hot spots. The second sock reduces the friction and will absorb the moisture from the inner sock while cushioning your foot inside the boot. The purpose of the two-sock system is so that the friction will occur between the layers of socks rather than between the socks and your feet. Once you get the proper boots and socks, then you are ready to begin your rucking prep work. Rucking is a lot like anything else. It is a skill that is learned gradually and by constant repetition. Many young people today want to be instant experts on everything, we live in that type of world today. However, don’t start off by trying to do a 20-miler or the equivalent of the Brecon Beacons on Day 1. Start slowly and gradually increase your speed and distance. As you get more comfortable and better at rucking, the speed and distance will become second nature. If you begin to get hot spots or blisters forming during prep work, stop right away and deal with those. Waiting until completion may result in a much more serious blister which will set your training prep work back. Once the hotspots and blisters are no longer an issue your rucksack training can begin in earnest. One more thing about your boots and again it is a personal choice is the way your boots are laced. Again, this is a personal preference type of thing but something to just keep in mind. I used to ruck most of the time in my favorite old jungle boots. The way the boots were constructed as was the way my foot is constructed, there was a bend in my foot that always rubbed during a long-distance ruck march right at the crease of the boot at the ankle. I’d always skip the eyelet right smack in the middle of my boots right there as it was always a sore spot that would rub. And after many 20-milers under my belt, it didn’t take long to figure out what needed to be changed. With the boots I wear today for the vast majority of my rucking (Merrell MOAB/ Sawtooth), I don’t have that issue. That’s where the prep work and repetition is invaluable. You will find certain things that will or won’t work for you. We have already tested a couple of different pairs of boots and posted reviews here on the site. I have reached out to a few different manufacturers to get a test pair for future articles here as well.